Everyone knows that when there’s a baby in the house you have to keep an eye on your newborn, and probably the best way to do so is to use a baby monitor so you can still go about your daily routine but still keep a check on your baby. And now if your are one of the iOS faithful in the United Kingdom, you can now purchase the Smart Baby Monitor that syncs to your iOS device via an app. The Smart Baby Monitor can be used with the iPhone, Apple iPad or computer via a dedicated free application that syncs the monitor to your chosen device enabling parents to check on their baby at any hour of the day or night whether at home or out and about. 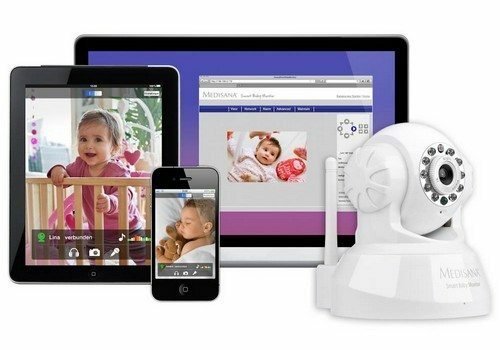 The Smart Baby Monitor offers both audio and video monitoring of your baby, allowing you to hear every gurgle, whimper or snore as well as streaming live video direct to your iPhone, Apple iPad of computer, whist the free app allows up to eight devices to access the Smart Baby Monitor camera to keep an eye on your baby. The device also features a sound and motion alarm that alerts any linked device when the child wakes, whilst the camera auto-adjusts to infra-red mode when the room light dims, and using the built in microphone and speaker, if your baby should awake you can sing them back to sleep without leaving your seat. Furthermore with the Smart Baby Monitor you can snap an image of your baby along with an option to adjust video frames per second, camera contrast and brightness via the Smart Baby Monitor app. The Smart Baby Monitor measures 25.5 x 25 x 29cms and weighs in at 245 grams and comes with a LAN cable, assembly set, power supply unit, CD ROM, quick user guide, whilst the iOS app is available for free from iTunes, and if you wish to purchase the Smart Baby Monitor you can do so at a cost of Â£119.95 by hitting up the Red5 website.